At the beginning of summer break, we started a family “summer bucket list” and each one of us had to pick three things that we wanted to do before the end of summer giving us a total of twelve things to try to do as a family. My youngest wanted to go to Winton Woods and visit Parky’s Ark and I’m so glad that was on her list. We recently visited Winton Woods and not only got to visit Parky’s Ark but we also stopped by Parky’s Farm. Both of these are gems in the Hamilton County Park District and provide endless fun for kids of all ages. After packing our lunch, towels, drinks and sunblock, we were on our way. Our first stop was Parky’s Ark. We purchased our daily wristband at the snack bar for $2/child. Kids over 13 and adults are free. If you think you’ll head to the wet playground more than once, you can also purchase a 3 pack of wristbands for $5 or a season pass for unlimited visits for $15. My girls love Parky’s Ark. There’s nothing more fun than getting sprayed with water on a hot summer day while joyously sliding down a slide inside a pirate ship. For me, I love that there is a nicely shaded upper level filled with tables and benches where you can sit and read a magazine while keeping an eye on the kids. 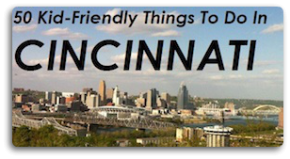 The other nice thing is that the Hamilton County Parks will let you bring in your own food and non-alcoholic drinks so you can save some money if you want to pack a picnic lunch. 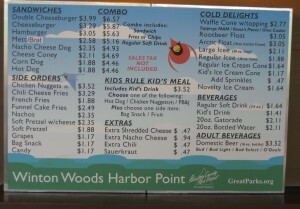 The full service snack bar also has lots of great things to munch on and you can get a kids’ meal for only $3.52 (includes hot dog, chicken nuggets, PB&J, side and a drink). Since we brought our lunch, I let the girls pick out an ice cream treat before we left. The other great thing about this park is that the dry playground is directly across from the wet playground and if your kids are like mine, they can’t resist a playground. So, we could easily shuttle ourselves back and forth between the two attractions. The dry playground is free so even after the wet playgrounds close, you can still enjoy the dry playgrounds year round. Winton Woods also has a harbor area where you can rent paddle boats, canoes, kayaks, motorboats and more. We didn’t get to venture to the harbor on this visit but one day we’ll return for some boating fun. You can also do some fishing on the lake. One thing that we always like to do is climb the stairs to the top of the overlook in the Winton Woods Pavilion. Here you can get a view of the 156 acre lake and the surrounding park. After a few hours at the wet and dry playgrounds, we decided to drive to another fun part of Winton Woods and we visited Parky’s Farm. Since it was a bit of a steamer, Parky’s Farm wasn’t too crowded which was great for us. We enjoyed seeing the farm animals and we knew it was hot when the big hog decided to lay down in his giant water bowl under a covered tarp. There are also donkeys, a Llama, Alpacas, goats, chickens, cows and horses to see. You can even go into the goat chorale and brush the goats. We got lucky on this visit since there were some adorable young goats to brush and pet. I love the scenery at Parky’s Farm – it is such a beautiful setting. All the bright red barn buildings are vibrantly displayed against the green lawns and backdrop of tress in the distance. I just love this place. Parky’s Farm has a really fun indoor play area ($2.50/child) but on this visit, we I decided that we would do that on another day since we could just head to the newer barn themed outdoor playground for free. There’s some nice covered shelters close by so this is another great place to have a family picnic or host a birthday party. The playground is great and will keep your kiddos entertained and their imaginations in full swing. Parky’s Farm is also home to the Winton Woods Riding Center where kids can take horseback riding lessons. There was a horseback riding camp going on while we were there and you could tell all the kids were having a great time despite the heat. Parky’s Farm also has pony rides for kids 48” and under ($2.50) or the whole family can take a wagon ride ($2.50/person) and enjoy some more farm fun. Winton Woods has so many more things you can do and one day we’ll get to try them all. They have a newly renovated campground area which includes an onsite store, café, playground and activity shelter. You can book a stay at a campsite or you can reserve one of their brand new deluxe luxury cabins complete with full kitchens, baths, air conditioning, a private queen size bedroom and lofts for the kiddos. There is also Wi-Fi access. Now that’s my kind of camping. If you want to sign up for a cabin, you may want to do it early since you can book a cabin up to a year in advance. Call (513) 851-2267 or visit greatparks.org for more information. Winton Woods also hosts a free Sizzlin Summer Concert Series in July. All the concerts are held at the Winton Woods Harbor on Saturday nights at 7pm; bring your own chairs and blankets and enjoy the show. Bring your appetites since they’ll be grilling some hot dogs and burgers for you to purchase ($3.50-$4.75 for a grilled dinner basket) or an ice cold beverage (yes that includes beer for the adults). For nature lovers, you can visit the Winton Woods Nature Centre, take a hike on one of the many trails or sign up for some of their free nature programs. Pick up their Evergreen Summer 2010 booklet on your next visit for a listing of all the wonderful programs provided by the Hamilton County Park District. It is amazing how much they have to offer for families. For golfers, you can make a tee time for the Meadow Links Golf course and remember they have a kids play free program after 5pm on the weekends. If you are new to visiting any of the Hamilton County Parks, you do have to have a valid parking pass to enter the parks. But, the parking pass is such a deal. It’s only $5 to purchase an annual parking pass. This allows your vehicl to get into any of the Hamilton County Parks for a year (not a day, a YEAR)! I also just purchased their 2010 Family Passport coupon booklet for only $10 that has some great coupons for the wet playgrounds, golfing, boat rental, Highfield Discovery Garden admission, and more. I actually already used three of the coupons recently after we visited Miami Whitewater Forest & Sharon Woods. HORSEBACK RIDING AT WINTON WOODS IS THE ABSOLUTE WORST!!! BORING PONY RIDE ON A BABY TRAIL!!!!!!!!!!!!!!!!!!! We were very disappointed in our horseback riding experience today, 7/11/13. We were expecting to ride horses – NOT PONIES. What a SCAM and a waste of $100, my two girls, 12 and 13, were mad, and so was I. If you want a boring trail ride with ponies on a baby trail, this is the place to go. The volunteer staff members are clueless, but they think they know everything; They pick the worst horses for you on your trail ride, and the trail is so babyish that there is absolutely no trotting, your not even allowed to hug your horse. We went so slow, that I could have walking my horse on a leash – that’s how slow they demand that you go, and you have to be at specific places at all times, and you have to wear your helmet, because it could get treacherous if your horse stops walking to take a dump. If you a REAL HORSE-BACK RIDING EXPERIENCE, I recommend you go to Muddy Waters Ranch. It was awesome when we went there last week, and we can’t wait to go back. Just confirms my suspicions that I need to get the boys up there one weekend! Thank for your doing this great post….I have heard of Parky’s Ark/Farm but didn’t really understand what it was…. I have tried to look at the park district website several times, but find it lacking in this kind of detail.